Monkey Around with Math Chimp! You’ll Be So Glad You Did! I’m so excited to share this site with you! It’s a great website for Math and I think you’re going to love it! Math Chimp has videos, games, and even free printable worksheets for primary and middle schools. All of the resources are categorized nicely by grade level, and they have begun restructuring the site to be Common Core friendly. Within each grade level, you can click on a specific common core domain that you’d like to target. The Math Chimp website is attractive and really easy to navigate (Avoid the unfortunate ads, though.) Many of the videos come from Khan Academy (another great Math video resource), and all of the printables and games are free. If you haven’t ever visited Math Chimp, take a look and see if there’s something you might just want to put into next week’s lesson plans! Math Chimp was created by educators and is ideal for children, parents and teachers. 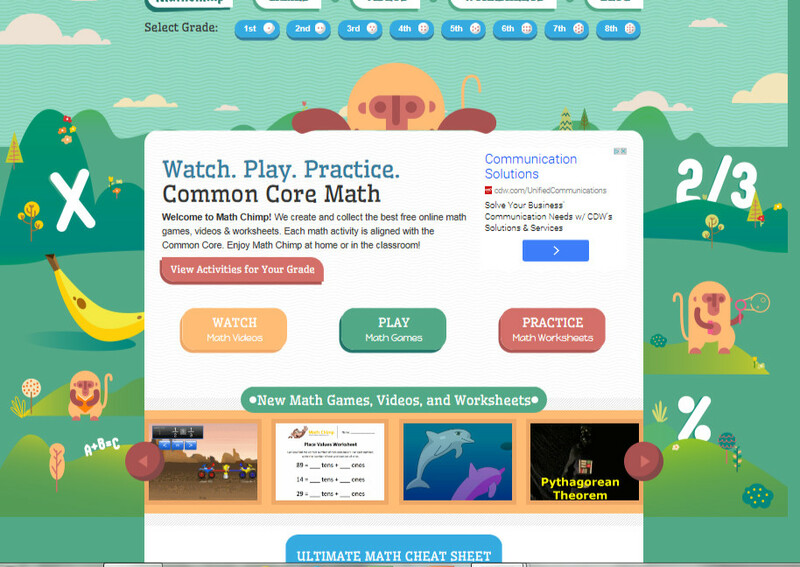 MathChimp.com is the home to the highest quality math games, videos & worksheets online. All of our activities are aligned to the Common Core Standards. Our mission is to provide engaging and helpful Common Core activities for 1st through 8th grade. Note: You can follow Math Chimp on Twitter, Facebook, Google Plus, and Pinterest!